We are pleased to announce IKEDA Manabu’s solo exhibition at Mizuma Art Gallery. Ikeda was born in 1973 in Saga, and in year 2000 he got his master’s degree from Tokyo National University of Fine Arts and Music. In 2001, He won a grand prize in the forth Hamamatsu nationwide public exhibition of painting. In 2006, he had his solo exhibition at Mizuma Action for the first time. With his epic work, “History of rise and fall,” he overwhelmed audiences and made a stunning debut. This exhibition called forth an echo, then Ikeda has been widening his appeal and participated group shows at museums in various places such as in Italy (trine), in Germany (Karlsruhe and Berlin) and in Canada (Hamilton and Victoria). His popularity is growing over the past year. For this expected exhibition, he challenged to draw the largest size of work he has ever done, which is 190 cm height by 340 cm wide. Since his thesis artwork for grad school, he has been consistently working on paper with pen and ink. Using thin pen point, Ikeda draws and weaves civilization and nature into story. We can see his pure curiosity and abundant imagination from his works. Trains run on tiled roof. Cars get caught up in a traffic jam at tunnel made of timber. Humans that were drawn in the size of 0.5cm climb, surf, and sometimes work at place like a construction site. Birds and airplanes fly the sky, on the other hand, imaginary creatures get behind quietly. Ikeda draws each lilting humorous scene depending on the feeling of the day without underdrawing. His drawing is surprisingly dense that he only can draw about the size of fist a day. However, with patience he piles up each scene as if it is a diary. When we see the whole image, we realize that the incremented details become a huge formed object. His work is not just a miniature painting, but he draws both micro and macro world at the same time that is because of his architectural point of view and excellent ability to construct. This is one of the elements of Ikeda’s uniqueness. In the past, Ikeda used ship (Regeneration, 2001), huge arbores (Existence, 2004), supernal city (Ark, 2005), and a castle (History of rise and fall, 2006) as themes. 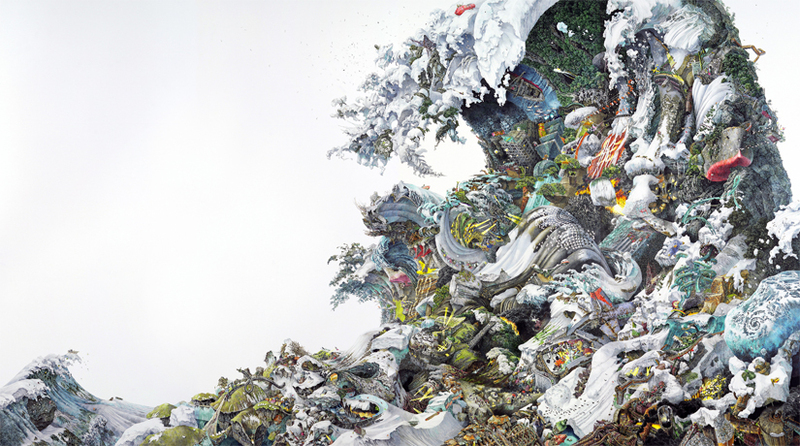 For his new work, he drew a civilization, which appeared from great waves or is about to be swallowed by tsunami/gracier. The world that was drawn on the paper is just one scene of the story in artist’s head. He always captures the image sterically. And his world goes on to the back of the buildings and inside of the rooms, and expands its capacity without an end. We hope you to view Ikeda’s unique story and his technique to realize it.